Support your existing S&K purple martin house, display your flag, or place a bird feeder in your backyard using the S&K Galvanized Steel Easy Pulley System Martin House Pole. This versatile unit allows you to use either just a few or all of its nine sections, so you can create a pole to perfectly meet your needs. Each section measures 21" long, with a 3" swaged end which connects to the next tube. The heavy duty steel construction creates a durable pole, able to hold up to 20 pounds, and one section can act as a ground sleeve for added stability. The included, plastic pole topper houses the pulley wheel, and the included rope cleat installs onto the pole with ease. Use the included, 22' long rope with this system to raise and lower your martin house or flag effortlessly. 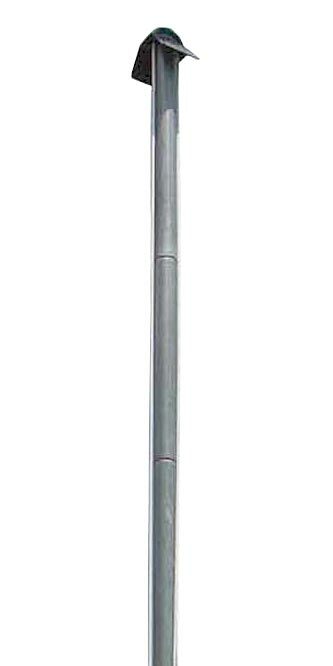 Properly elevate your martin house using this Galvanized Steel Easy Pulley System Martin House Pole. Assembly required. Made in the USA.